Smooth-billed Anis are the late-1960s, commune-dwelling hippies of the bird world. Found as far north as the southern United States, and residing over much of the Caribbean and Central and South America, as many as six females lay their eggs in a shared nest. Ani chicks are raised by the group, with the help of multiple males and non-breeding helpers. It all sounds like a synergistic, happy-go-lucky love fest. Closer examination shows that the situation isn’t quite so lovely as it appears. 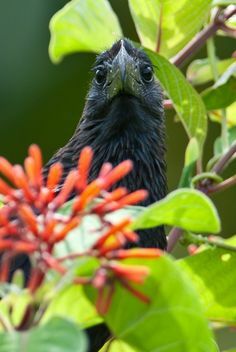 Communal they may be, but members of a Smooth-billed Ani group sometimes bury eggs, or roll eggs up the side of the nest and toss them out. There are at least two functions for this ovicidal behaviour. By destroying the eggs of others, a female can reduce the competition for limited resources for her own chicks. If she buries older eggs, or tosses older eggs from the nest, she helps to ensure that her chicks will not be the youngest in the nest. In doing so, her chicks will not be at a disadvantage because of competition with older chicks. Leanne Grieves and James Quinn of McMaster University in Canada studied the ovicidal behaviour of Smooth-billed Anis in Puerto Rico. They explained that when they are first laid, ani eggs are white because they are covered with a thin chalky layer. When that layer wears away over a period of days, the underlying blue colour of the shell is exposed. Grieves and Quinn asked whether female anis might use the blue colouration of shells to indicate that the eggs had been laid some days earlier, and use that cue to eject or bury eggs when laying their own. The researchers scraped some eggs with a small brush to wipe away the chalky covering, leaving them blue. In order to introduce a level of control, other eggs were handled, but the chalky covering was not removed, and so the eggs remained white. Grieves and Quinn found that blue eggs were no more likely to be buried that white eggs. Blue eggs were also no more likely to be thrown from the nest. Colour does not seem to be a cue. However, they found that females in larger communal groups were more likely to engage in both of the destructive behaviours than females in smaller groups. In larger groups with four or five females, an egg was twice as likely to be destroyed as an egg in a group with just two or three females. Given their size, female Smooth-billed Anis lay very large eggs; nearly 18% of their body weight goes into each one. An egg is a large investment. The greater the group size, the greater the competition. In order to make her investment of energy and resources worthwhile, it seems that females in larger groups will go to great lengths to ensure that her eggs, and therefore her chicks, are the ones to survive. Life can be tough, even in a commune. Grieves, L. A., and J. S. Quinn. 2018. Group size, but not manipulated whole-clutch egg color, contributes to ovicide in joint-nesting Smooth-billed Anis. Wilson Journal of Ornithology 130:479-484. 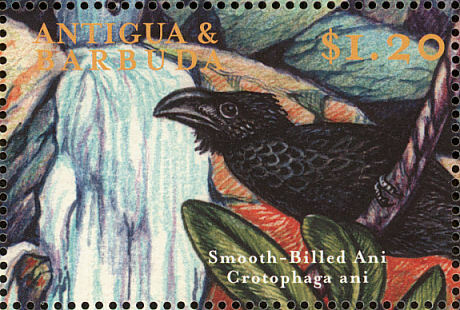 Photo credits: Smooth-billed Ani – www.pinterest.com; Smooth-billed Ani stamp - http://www.birdtheme.org/showimages/antiguab/i/anb200010l.jpg.